It’s fair to say that practically nothing is more important to your health than making sure that your oxygen level is sound. When you suffer from a lack of oxygen in your blood, the consequences can be disastrous. What begins with a few minor inconveniences and discomfort can quickly spiral into a nightmarish descent into pain and poor health. If you don’t know how to check oxygen level at home, read on to find out the methods you can use to check and ensure your oxygen level is not too low. Most of us are lucky enough to never have to deal with such issues. Our body does a fantastic job of naturally regulating the amount of oxygen in our blood. For those who suffer from hypoxemia, however, this can be a daily struggle. None of those are pleasant on their own, and taken together they can be downright awful. Unfortunately, the effects of hypoxemia can be even worse, with long-term consequences including damage to your internal organs and increased difficulty breathing. But there are a number of ways on how to check oxygen level at home. Below are some of them. Now that we have a better idea as to what hypoxemia is and why it matters, it’s time to discuss ways of combating it. The most important tool in your arsenal here is, as indicated, a means by which to measure the oxygen level in your blood. If you are checking to see whether or not you have hypoxemia or related conditions, or are otherwise looking to track the status of your condition, your doctor may order a blood sample from your arterial region. As stated above, a deficiency of oxygen in your arteries can be particularly troublesome, so measuring oxygen levels here can be of the utmost importance. That being said, it’s fair to say that this method of measurement isn’t exactly easy to have done in your own home. For that reason, specialized tools exist which allow patients to read their own blood oxygen levels from the comfort of their own home. In the same way that diabetes patients use machines to test their blood at home, so too do patients suffering from hypoxemia or other conditions which involve low oxygen levels typically employ a pulse oximeter. Also like diabetes patients, breakthroughs in medical technology mean that the old, painful practice of having to test your blood by pricking your finger for samples is rapidly becoming a thing of the past. 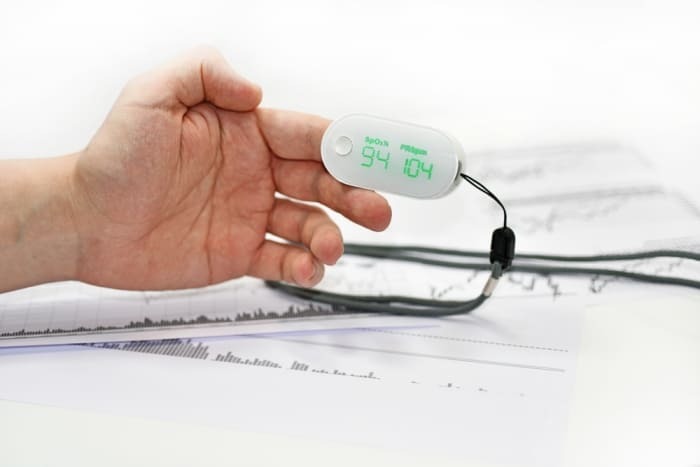 Instead, modern pulse oximeters fit neatly over your figure and take readings of your blood oxygen levels. They are able to accomplish this by sending wavelengths of light through your body in such a way as to determine your blood oxygen levels via photodetectors. These units take readings of your peripheral oxygen saturation, while arterial blood tests provide doctors with your level of arterial oxygen saturation. While the latter is preferable, and may still need to be measured from time to time, the former is typically fine for day to day living. In addition, it is worth noting that, while pulse oximeters are typically accurate, they can occasionally be thrown off when hemoglobin in your blood interacts or otherwise binds to something that is not oxygen. If you do get a false readout, you should not panic, especially if you otherwise feel fine and your results have been consistently good of late. That being said, it may be prudent to schedule a checkup with your doctor to double check, especially if the readout is extremely high or you experience any of the aforementioned symptoms of low blood oxygen levels. Hypoxemia and other medical conditions which involve low oxygen levels should never prevent you from living your life to the fullest. At the same time, if you have a big, bulky blood oxygen reading machine, it can make travel difficult. Thankfully, medical science is increasingly addressing this concern with pulse oximeters which are smaller, more compact, and more travel-friendly. If you are planning on flying, you will want to check ahead of time with the airline to see about any special measures you may need to take in order to clear your medical equipment with airport security. Your doctor may need to write a letter testifying that you require your equipment with you at all times. One interesting wrinkle to enter into the discussion regarding pulse oximeters and measuring blood oxygen levels of late is the Apple Watch, which can measure your heart rate. The technology employed in the Apple Watch which allows the unit to do this can also potentially be used to track blood oxygen levels in the future. That being said, while this is a very promising sign for the future, at present, you are better off using a standard pulse oximeter, the Apple Watch should not be considered a substitute for proper medical technology, and you should clear any readings you might get from it with your doctor. Last but not least, if you find yourself with further questions about the particulars of how to check your oxygen level given your personal circumstances, you’ll want to speak to an expert, such as your doctor or healthcare provider. They can give you more in-depth information as to the latest instruments for blood-oxygen measurement on the market today. What’s more, they can also help answer any questions you might have as to the accuracy of readouts or the future of your treatment. Living with a medical condition should not mean having your life defined by that fact. Armed with the right tools and information from your doctors, you don’t have to let low blood oxygen levels keep you from enjoying the highest heights life has to offer. So if you didn’t know how to check oxygen level at home, the above methods are your best bet as far as checking your oxygen level at home or on the go is concerned. It’s important to always check and ensure your oxygen levels are not too low so as to avoid the complications listed above.